It was with mixed feeling that I climbed into my parent’s vehicle to head for the airport in Chiang Mai, Thailand. There were sad feelings were due to saying farewell to my wife and 3 younger sons for 9 days. Those feelings of sadness conflicted with the emotions of excitement as I was finally traveling to India with my father, Raymond, to participate in an MTM youth conference in Gyalshing, West Sikkim. This was a dream that both my father and I had for many years that has finally coming to fruition. It was also exciting that my two oldest sons, Kyran (11) and Raygan (9), were going along as well. Throughout our time in India, the concept of raising up leaders, next generation leaders, to continue the work of God was often in the forefront of what was talked about as a team and what was also taught as we ministered at Church Sakyong, in West Sikkim, India. The MTM Ministry Team L-R; Pastor Enos (Interpreter), Raymond, Michael, Kyran & Raygan (Mike’s sons), Choukie (Ps Nugo’s wife), Ps Nugo, Chokel (Ps Nugo’s son), & Subba (our driver). There were three generations of Burkholder’s that were part of the MTM team that travelled to India. Raymond (my father), myself, and my 2 oldest sons. Pastor Nugo, from Bhutan, was the coordinator who organized the conference. Pastor Nugo’s wife, Choukie, and their 18-year-old son, Chokel, were along as well. Chokel is a gifted worship leader who led worship at the youth conference. It was a beautiful experience to have my father coach and mentor me in cross-culture ministry and then to also see Pastor Nugo mentor and coach his son in the work of the conference as well. Naturally, there was mentoring and teaching that I was passing on to my sons throughout this whole time. Pastor Nugo, the coordinator with which MTM was partnering, was also being very intentional about raising up other leaders who can continue to lead well after the conference and after we are departed from India. Pastor James is the pastor of the church where the conference was held. 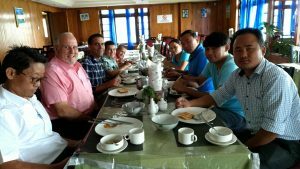 Pastor Enos is part of a leadership team that provides leadership to many house churches in the state of Sikkim. Pastor Nugo placed them as the leaders of the conference and coached and mentored them on how to run the event. Pastor Nugo is a gifted interpreter, yet he had Pastor James and Enos do the interpreting as part of the goal of equipping them to better lead their people. Pastor Manoj is also a local church leader who assisted with the interpreting for Dad and me. Our theme for the conference was Pursuing the Heart of God. Raymond shared a series of sessions on David and I shared from the life of Joseph from the Old Testament. As we both shared our sessions, we were struck by the overlap in our material from the life of David and the life of Joseph. Even though we hadn’t strategized or planned it, we were blessed how God had orchestrated our sessions to minister to the attendees ‘line upon line and precept upon precept’. We were also blessed to see God at work and move in the lives of those present. Dad gave an invitation after his one session on being an empty vessel that God can fill and use. About 75% of the church was at the altar pouring their hearts out to God in brokenness and surrender. 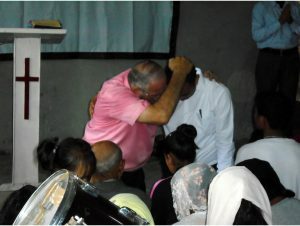 Pastor James, the leader of the church, came to my father during the invitation and asked him to pray with him as it is his desire be an empty vessel that God can use in the leading God’s church. 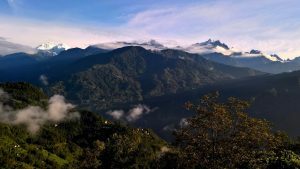 North west Sikkim state of India is a beautiful land of rugged mountains and snow-covered peaks as well as many waterfalls. It was a common experience to be driving on a mountain road and pass right next to a rushing waterfall. As it was beautiful to see the water cascading over the rocks, it was also wonderful to see and be a part of the cascading work of passing along leadership and empowering others to rise up and lead like Jesus. It was invigorating to observe Pastor Nugo and my father as they intentionally worked to equip others to lead well in their roles. 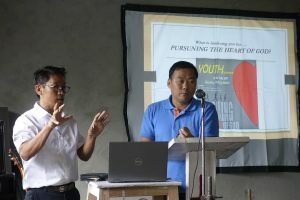 And simultaneously challenging the youth attending the conference to pursue the heart of God, as God needs them to follow in the footsteps of their leaders. There was an average attendance of 65 youth and others at the conference from this remote geographical region of the world. I invite you to pray for them that God would continue the work in their hearts that was started at the conference. Please lift up Pastor James and Pastor Enos in prayer as well as they provide leadership in their respective areas. It is my prayer that the work of empowering and equipping others in the growing of the Kingdom of God would continue in West Sikkim, India. Most of all, it is my heart’s desire that the Lamb that was slain receive all the honor and glory for the work of MTM and Pastor Nugo in India. Editor’s Note; The above article was written by Michael Burkholder (the editor’s son). Michael & his wife Laura and their five boys live at Bowmansville, PA.USA. Michael is one of the pastoral team at Faith Mennonite Fellowship church which is also Raymond & Naomi Burkholder’ USA home church. A very special thank you to the Faith Mennonite Fellowship Church congregation for sending Michael & Laura & their family (five sons) to Thailand to visit their parents. Another big thank you for prayerfully sponsoring this India conference by sending Michael to stand beside his father in teaching the gospel among all nation. Also, a much appreciated thank you from MTM for financially sponsoring the India youth conference. It indeed was very special to have a part of our family with us in serving the Lord here in Asia. CLICK HERE TO VIEW THE ENTIRE PHOTO ALBUM!! PreviousPrevious post:VIETNAM? ?NextNext post:The Staggering Needs of Maharashtra State of India! !